Aurelia (= "Lillian") Julia Schwert was born on February 14, 1896, and she was baptized by Father Ferdinand Kolb of Saint Boniface R.C. Church in Buffalo on February 16, 1896. Her godparents were Franz and Julianna Catharina (née Schlia/Schlee) Schwertfeger/Schwert. On the 1900 Census, Aurelia's name is presented as "Lillian." On February 24, 1914 at Saint Nicholas R.C. Church in Buffalo, Lillian wed Edward Leon Schwartz. Edward was a son of George and Elizabeth (née Warhus) Schwartz. They had two children: Dorothy and Beatrice. 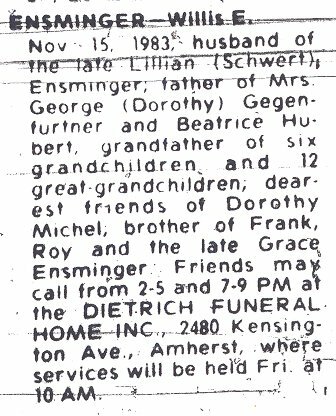 The obituary for Lillian’s father Johann (= "John") (1938) shows that she was at that time she was now married to Willis Edgar Ensminger. Willis, born on October 16, 1899, was a son of William and Annie Ensminger. Various Buffalo city directories show that Willis was a welder and that the couple resided at 10 Medford Place. Lillian died in 1960. Willis died on November 15, 1983. Both are interred at Wheatfield Cemetery, Mapleton Road, Shawnee Township, Niagara County, NY. Dorothy Lillian (née Schwartz) Gegenfurtner: Born 1914; died 2007. Beatrice Marie (née Schwartz) (O'Brien) Hubert: Born 1917; died 1996. Baptism Record: Aurelia Julia Schwert, born February 14, 1896; baptized on February 16, 1896 by Father Ferdinand Kolb of St. Boniface R.C. Church, 124 Locust Street, Buffalo, NY. Obituary: Willis Edgar Ensminger, died November, 1983. 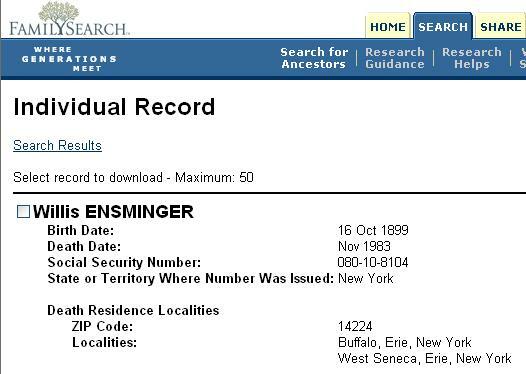 Social Security Death Index: Willis Edgar Ensminger, born October 16, 1899, died November, 1983.